Unlike in the United States or other places around the globe, Santa Claus visits Switzerland not on the 24th of December but on the 6th of December. He also does not bring gifts but a huge bag filled with chocolates, peanuts and mandarines for everyone to share. However, not everyone is allowed to dig in! Let me explain, how the Santa tradition in Switzerland works. In the evening of December 6th the Samichlaus visits every family with his helper 'Schmutzli' which literally translates to 'dirty one'. This helper is usually dressed in all black clothes and appears with a blackened face. Unlike in other countries, Santa actually knocks on the door and is invited in. Maybe Swiss chimneys are simply to narrow for him to climb down?! Sometimes, Santa even has a donkey with him that carries his bag of treats. 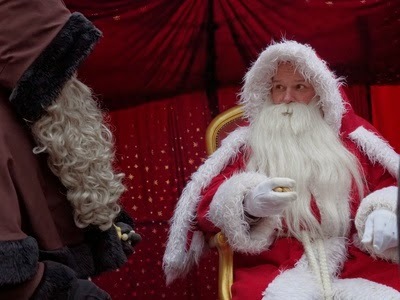 Once inside, the Samichlaus orders his helper to put down the big bag with the treats and open it to show everyone what he has brought with him. He then calls up everyone present one by one and gives them a report on how they behaved during the last year. The parents usually tell Santa beforehand about each child present. He'll praise children for doing their homework or always helping their parents but he'll also give hints in which areas they still have to improve. After receiving their report, every child can try to improve their standing with Santa by reciting a Christmas or Santa related poem. A good report and a good poem will get a child a big handful of treats. A bad report and a bad poem usually lead to a reprimand by Samichlaus and in severe cases even endanger you of receiving blows from Santa's helper or being stuck into Santa's bag and carried off with him. At least, that's what we were told as children. Promises to do better next year usually save you from that. Santa also gives a report to parents and grown ups but usually in a rather funny way which is not to be taken too seriously! So I hope you behaved this year and will receive treats and not be carried off!